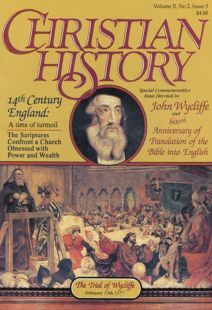 John Wycliffe was born into a century when the medieval world was coming to an end while a new world was not yet born. The Church, which had brought civilization and order to Europe, had grown in wealth, property, power … and corruption. The Crusades had ended, but France and England now turned on each other in extened combat. Kinghts in armor would fall to archer. Genghis Kahn was dead but his decendant, Tamerlane, would devastate the Asian continent. Even greater devasteion would plague Europe when the Black Death would kill 75 million by the end of the century. Exotic gifts from the Orient and mysterious tales from African empires south of the Sahara were shared by traders and explorers. Still unknown to Wycliffe’s Europe were the cultures already thriving on continents yet to be discovered in the century ahead. 1367 Deposed at Canterbury Hall by new Archbishop of Canterbury (Langham); appeal to Pope Urban V fails. 1377 New Parliament reverses acts of "The Good Parliament"
1369 Tamerlane (Timur the Lame), 33, makes himself master of Samarkand, in Turkestan and builds army that will conquer much of Asia. Wycliffe’s Bible was only a beginning.